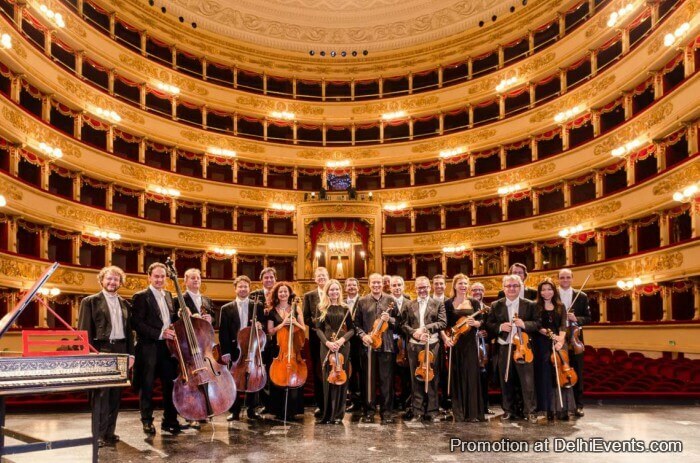 Event Description : MUSIC : Concert by La Scala Chamber Orchestra “Camesristi della Scala” of Milan. leaders of La Scala orchestra as soloists as well as performs with many well-known instrumentalists and opera singers. Significant artistic influence from celebrated great conductors of the past and present working at Teatro alla Scala contributed to the character and the shape of Cameristi's musical phrasing blended with distinct Italian sound. Cameristi della Scala has performed in many prestigious venues and concert halls throughout the world. The current 2017-18 Season includes Cameristi's first tour in India, first appearance in Tunisia as well as performances in the Meisterinterpreten Series in Tonhalle-Maag Zürich, in the Beethovenfest in Bonn, Lisinski Theatre in Zagreb and in the closing concert of Variations Musicales de Tannay in Switzerland. For the Centennial Year of Leonard Bernstein, Cameristi della Scala will perform a special concert commemorating the great musical icon at Teatro alla Scala in May 2018. Together with the celebrated Italian La Scala principal dancer "étoile" Roberto Bolle, Cameristi is developing an original project to be performed at 2018 Davos World Economic Forum with further plans beyond for continued collaboration. Rounding off an exciting season, a commission of a new piece written by the composer/cellist Giovanni Sollima will be given its world premiere at Teatro alla Scala by Cameristi. Highlights of Cameristi della Scala's recent major projects include two concert series at Carnegie Hall in New York, performances in the United Nations Auditorium, the Library of Congress in Washington DC, MIT in Boston, Tchaikovsky Hall in Moscow, Salle Gaveau in Paris, Tonhalle in Zürich, Warsaw Opera Theatre, Teatro Coliseo in Buenos Aires, Sony Center in Toronto, Canary Island Festival as well as international tours to China, Germany, France, Spain, Switzerland, Scandinavia, Eastern Europe and Turkey. During a 2010 tour to Israel, Cameristi had the honour performing at the Mann Auditorium in Tel Aviv and in Expo 2010 Shanghai China, Cameristi della Scala gave four concerts before large audience in Shanghai in the occasion of the city of Milan week. In 2011 Cameristi opened Emilia Romagna Festival in Imola and in collaboration with the Associazione Musica del Risorgimento, Cameristi della Scala performed for the celebration of the 150th anniversary of the establishment of the Kingdom of Italy beside appearing also in MITO SettembreMusica Festival. Between 2007 and 2009 Cameristi della Scala was featured annually in the Grand Summer Concerts in Piazza del Duomo in Milan in front of 20.000 audience. For this summerconcert series, a new piece dedicated to the Cathedral of Milan was commissioned and performed each year by Cameristi to an important living Italian composer. Cameristi della Scala received the Premio Isimbardi (Isimbardi Prize) in 2012 from the Province of Milan as a recognition for their outstanding contribution to the community and the prestige of the city of Milan in the world.